Thanksgiving can be challenging given everyone's food preferences. If you're looking for an alternative to pumpkin or sweet potato pie, this light and creamy cheesecake will be a welcome addition to your holiday dessert table. You can't imagine my delight when this came out of the oven. It looked like, tasted like, and had the texture of a New York cheesecake. The Fabbri Amarena cherries, made from select Italian wild black cherries, truly were the "cherry on top" - a delicious surprise on an already delicious dessert. Note: It was just the melted butter in the crust where I didn't find a good non-dairy substitute. However, since making the cheesecake, a representative of Kite Hill suggested using coconut oil. I haven't tasted this, but do see that it is on the ingredient list of the Daiya frozen vegan cheesecake. Note: Crust can be baked 1 day ahead, cooled, covered tightly and stored at room temperature. Place a rack in the middle of the oven. Preheat the oven to 325 degrees F. Generously grease a spring-loaded 9" pan with butter (or coconut oil). 1. Melt the butter (or oil) in a small pan over low heat, and set aside until slightly cooled. 2. In a food processor, pulse the almonds, flour, sugar and salt until the almonds are finely ground and mixture is well combined. Add the silken tofu and pulse to combine. Add butter (or oil) and pulse until mixture has the consistency of wet sand. 3. Press the crust into the bottom of the pan and about 3/4 of the way up the sides. Spread the crust out by pressing a straight-sided measuring cup around the bottom and sides. Use your fingers to finish, if necessary. Chill the crustt until firm, about 20 minutes. 4. Bake the crust until it is evenly golden brown and set, about 12-14 minutes. If the crust slumps, it can be pushed back into place with the sides of the measuring cup while it's still warm. Place the pan on a wire rack to cool. Note: This section requires a hand-held electric mixer for best results. 1. Using an electric mixer on medium speed, beat the cream cheese spread until it is smooth, about 1 minute. 2. Add the ricotta and coconut cream, and beat until well incorporated. 3. Add the silken tofu and mix. 4. With the mixer running, slowly add the sugar and salt. Beat until the filling is creamy and smooth, about 2 minutes. 5. Add the almond extract, vanilla extract, lemon and orange zests, and mix just to incorporate. Keep the oven at 325 degrees F.
1. Fold a layer of foil around the bottom of the prepared pan to form a waterproof seal. You might have to attach two sheets together, and then fold up the side of the pan. Repeat with several more pieces of foil. 2. Set the prepared pan inside a large roasting pan or baking dish, and pour the filling inside the crust. It may go above the crust. 3. Set the roasting pan in the oven, and add very hot water about 1/2 way up the sides of spring-form pan and foil. 4. Bake for 60-75 minutes until the top of the cheesecake is set and dry to the touch. The filling may still wobble underneath; it will firm up as it cools. 5. Let the cheesecake cool on a rack for about 10 minutes, and then place the baked pie in the refrigerator for 3-4 hours until the pie is cool and firm. When ready to serve, remove the sides of the spring form pan and place on a plate. 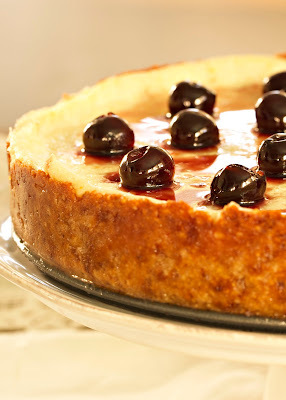 Add the cherries and drizzle syrup to the top of the cheesecake. The cheesecake can be refrigerated tightly covered for up to 3 days. 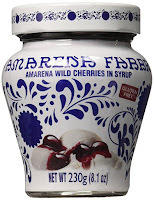 To order the Fabbri Amareno Cherries, see the link here. Recipe adapted from Bon Appétit magazine, November 2017 issue, link here.